The crater was most likely formed by a meteor that struck the surface at a very shallow angle. The best way to imagine this is to imagine the meteor hitting the ground like a plane landing, except the meteor doesn't have wheels so it slides across the surface until friction brings it to a halt. Another suggestion is that the crater was originally rounder, but due to erosion and gravity the side of the crater collapsed in on each other and filled in everything but what we see now. This crater could actually be the result of two or three adjacent craters where the adjoining rooms have eroded away. Though I'm not a professional I think the crater was formed relatively recently when a meteor struck the surface at a shallow angle. One reason we can surmise this is because the floor of the crater has less smaller impact craters checkering it than the surrounding terrain. From that we can infer that the crater is from a relatively recent impact. We can also tell by the shape of the depression. When a meteorite hits it begins disintegrating because it is impacting as such high speeds. At such a shallow angle the meteorite would get smaller as it slid across the ground, thus the shape we see below. This crater could be a merger of two recent craters, but if there was enough wind erosion to remove all signs of an adjoining crater wall there would probably also be enough wind to erode a lot of the smaller surrounding craters. Today's Image of Mars shows concave up features called 'festoons' on some rocks imaged by Mars Exploration Rover Opportunity. These geometric features, when found in sedimentary rocks like these, imply the presence of small, winding sand ripples that only form in the presence of water on Earth. In short, these festoons are preserved remains of tiny sand dunes that formed long ago by ripples in shallow water on the surface of Mars. Clicking on this photo will take you to the NASA gallery where this image can be found and downloaded. Today's Image of Mars shows Zunil Crater, located in Mars' Cerberus Plains, the youngest (least cratered) large lava plain on Mars. This 10km in diameter crater was created just a few million years ago. The impact is thought to have created 10 million secondary craters measuring 10m in diameter or larger. These secondary craters reach as far as 1600km. It is thought that the Zunil impact crater could be the source of many shergottites, or meteorites from Mars that fall to Earth. Shergottites from two different periods (1.5 and 2.7 million years ago) are known to exist. This image was taken by Mars Odyssey Orbiter's THEMIS camera. Clicking on the image will take you to the original THEMIS page. Reporting on the Russian Phobos-Grunt mission has been checkered with inaccuracies. Please ensure that when you hear or read something about its upcoming reentry you check the source. Note that it is impossible to determine where Phobos-Grunt will land until just minutes before it does so. Anyone that claims to know where it will land either misinterpreted something or is lying. In the coming weeks there are bound to many over-hyped reports about the toxic material aboard the failed probe. Do not listen to the fear-mongering headlines, but make sure to pay attention to he sources in the news stories. Do you want to help inspire others to take an interest in space exploration? What's stopping you? What, you thought you had to be a rocket scientist or billionaire to make a difference in the space industry? Well you don't. Anyone can help inspire other people to take an interest in space exploration. Below are some suggestions on how you can use your interest in space to inspire others using social and new media! The easiest, least time consuming way is to begin posting about space on your social media accounts, like Facebook, Twitter, Google+, or any other ones you have. If you read a cool space article then share it with people! Sometimes people aren't interested in space because they aren't exposed to all the fascinating news or images about it! So many space-related sites (including this one) make it incredibly easy to post their articles to your Facebook, Twitter, Google+ and other social media accounts! If your friends/followers see that you are interested in an article then maybe they'll check it out and become interested too! You can start a blog about space that showcases some of the cool things you find when bored and perusing the Internet. There are numerous Space sites that cover all aspects of space, but a lot of times you will find some specific space topics that do not have their own site dedicated to them. If you have a blog you will also have content for your social media accounts! Try to create content, either on a blog or through social media, that will appeal to an audience other than the typical space enthusiasts. If you can make space appeal to people with seemingly unrelated interests like art, entertainment, etc., then you could inspire even more people to be interested in space that might not otherwise have been. YOU can inspire others to take an interest in space. There are so many amazing discoveries to be made in space, but they are dependent on space enthusiasts spreading the word and inspiring others to take an interest. The more people interested in space the more support there will be for future space research and exploration. You will be amazed at the number of people you can inspire to take an interest in space through social and new media. You'll also have a lot of fun doing it and find tons of people that share the same interest in space as you! Give it a shot; you will probably be surprised at what you find. If you need some inspiration on how to use different social media platforms to promote space related content then feel free to check out all of mine! Today's Image of Mars was taken from low orbit by the Viking I Orbiter in an attempt to help scientists get a better understanding of the atmosphere on Mars. Coincidentally the orbiter captured Galle Crater in its photo. Galle Crater is often called the 'Smiley Face Crater' because it resembles a happy face icon. Galle Crater is 230km in diameter. Clicking on this image will take you to another close up image of Galle Crater. Today's Image of Mars shows what different stages of a solar eclipse by Phobos looks like on Mars. Phobos is the larger of two Martian Moons. These three images were taken by Mars Exploration Rover Opportunity on the 45th sol (Martian day) of its mission. Phobos is only 27km in diameter at its longest point, so as you can see it doesn't completely block out the Sun. Clicking on the image will take you to the original NASA press release on these images from March 11 2004. Today's Image of Mars shows part of a dune field found within Proctor Crater. Proctor Crater is approximately 150km in diameter and lies in the Southern Highlands of Mars. The dark dunes seen in this image are made up of basaltic sand which has collected at the bottom of Proctor Crater. On top of these large dunes lie smaller secondary dunes consistent with terrestrial dunes of similar size. In this image you can see that between the large, dark dunes lie smaller, brighter formations. It's been suggested that these are smaller dunes or granule ripples composed of material that is different from the larger dunes. The large, dark dunes overly the the smaller, brighter features, implying that they are a more recent addition to the crater. Both the large and small features were formed through wind erosion. We can see in this image that the orientation of the smaller features was affected by the placement of the larger dunes.This is because wind must flow around the larger dunes. HiRISE continues monitoring Proctor Crater to determine whether the dunes are still active today. Clicking on this image will take you to a similar, captioned HiRISE image of dunes in Proctor Crater. 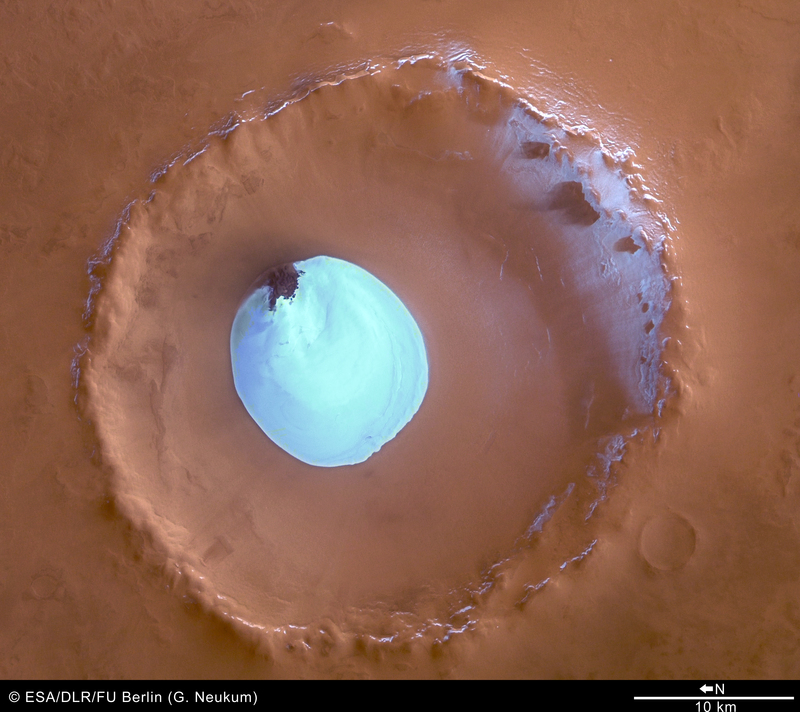 Today's Image of Mars shows a partially exhumed crater in Evros Vallis. What exactly is an 'exhumed' crater? An exhumed crater is one that formed a long time ago, but was subsequently buried. It becomes re-exposed because the materials that originally filled and covered it start to erode. This is because oftentimes the materials that fill a crater are less wear resistant than the surrounding terrain, making them easier to erode. In this image you can see many different dunes surrounding and even in the crater. Evros Vallis is full of these dunes. What do these dunes tell us? Well if you look at this image you can see that not all the dunes have the same orientation. Since Martian dunes are created almost entirely from wind they are generally oriented the in the direction the wind was blowing. Because these dunes and others like them in Evros Vallis have different orientations we can tell that different 'wind regimes' were involved in the creation of the dunes. A 'wind regime' simply refers to the a pattern in the regularly flow and direction of the wind. This image was taken by HiRISE. If you click on it you you will be taken to the original captioned image from them. Today's Image of Mars was taken by Mars Exploration Rover Opportunity shows a geological region of the rock outcrop at Meridiani Planum. This photo shows an area approximately 1.5cm across. 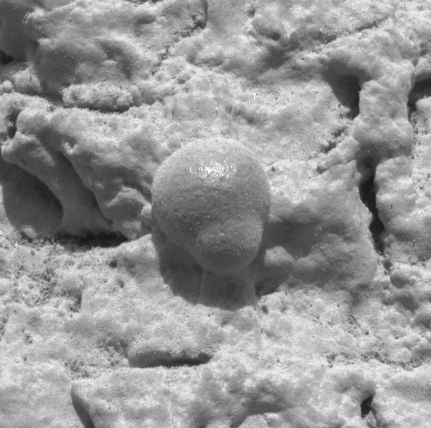 This is one of the famous "blueberries" which are grey hematite concretions and evidence that water once existed on Mars. 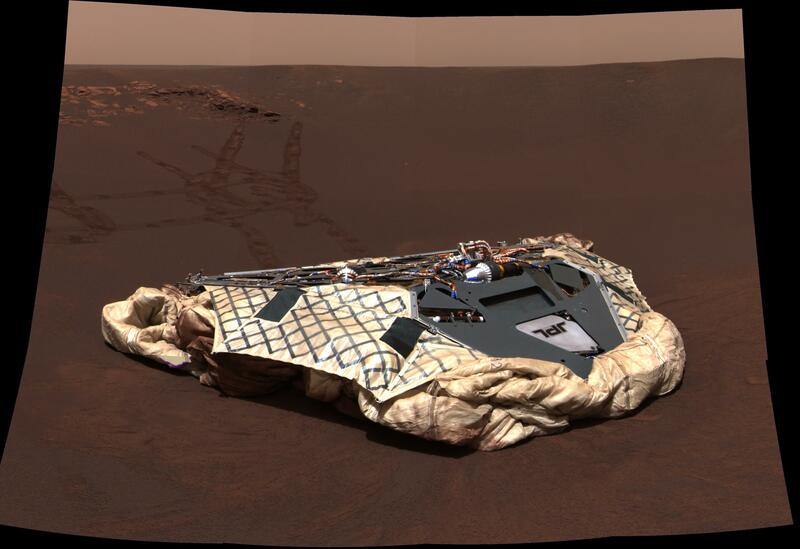 This image was taken by Opportunity on Sol 28 of its mission, which was just a few weeks after it landed on Mars. Clicking on this image will take you to images and articles pointing to further evidence that water was once abundant on Mars. Today's Image of Mars is of faults in Ius Chasma, one of many deep depressions in Valles Marineris, the solar system's largest known canyon. Ius Chasma is about 900km long and 8-10km deep. The chasma is divided by an east-west ridge called Geryon Montes. The floor of Ius Chasma is comprised of layered deposits, but due to excessive faulting the deposits have become jumbled. The dark spots you see in this image are the result of ejecta from impacts. They have exposed a layer underlying the lighter surface area. Scientists speculate that the darker layer being exposed is basalt. If you look closely you can also see many linear dunes, which are prominent all throughout Ius Chasma. These dunes have a north-south orientation, which is indicative of prevailing westerly winds through the canyon. Today's Image of Mars is of Hebes Chasma, an enclosed trough located in the most northern part of Valles Marineris that measures nearly 8000m deep. 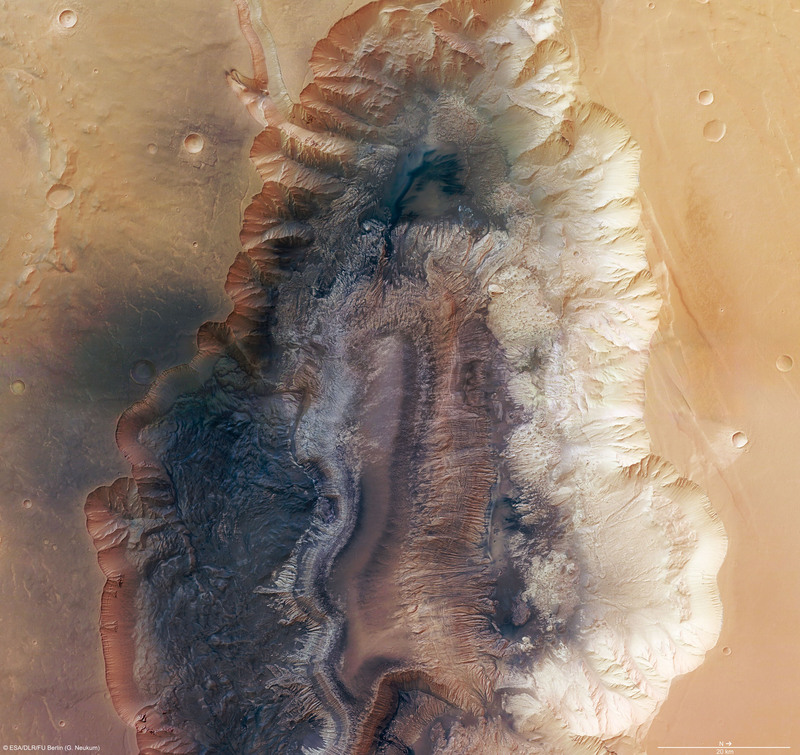 In the center of Hebes Chasma is an 8000m high mesa (flat topped mountain) with many layered deposits. It almost rises to the same height as the terrain surrounding Hebes Chasma. Measurements from the OMEGA spectrometer on Mars Express have shown water bearing minerals, like gypsum, in Hebes Chasma, evidence that there was once an abundance of water in the trough. It is thought that Hebes Chasma formed because of enormous stress in the Martian crust, which resulted in a number of radial faults. This stress was likely caused by crustal uplift from the development of many volcanoes in the nearby Tharsis region. Today's Image of Mars shows frosted gullies in a North Polar region crater. 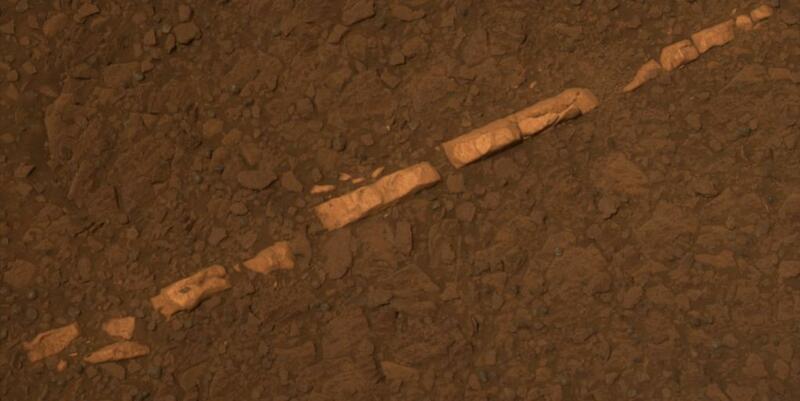 This image was taken in the summer months on Mars. The frost has survived because it lies within the North facing alcoves of the gully and is constantly shrouded in shadow. There are similar gullies on the opposite side of the crater, but because they are facing south the frost inside them has melted. The gullies depicted in this image have the large alcove at the top of the crater wall and channels that flow down into the crater. Some of these gullies show current activity, but it seems that the most activity is at the height of the winter season when the temperatures are the lowest, which leads scientists to believe that the activity is caused by falling loose material and not liquid water. This image was taken by HiRISE. Clicking on the image will take you to the original captioned image from them. "The cost… is fundamentally what's holding us back from becoming a space traveling civilization and ultimately a multi-planet species." For private space missions and projects the biggest obstacle is often funding. With a few exceptions, most space companies have been started by someone with a lot of personal capital, otherwise they would have no way to get their company off the ground. Space research and development is an expensive business and most private space companies must vigorously pursue government grants if they have any hope of becoming competitive. So what happens when the government doesn't take an interest in a space company's projects? They die. The space company might struggle along with personal funds, but eventually they need government support to sustain the research, development, and testing necessary to remain relevant. Is there no other way? Is the government the only entity that can provide funding for space projects and missions? Right now the government is virtually the only consistent customer for anything more than satellite launches They are the only entity that will fund space projects and missions for the sake of research and development. There is an alternative to government funding, but it requires space companies to develop a completely new Public Relations (PR) strategy. Space companies must capitalize on public interest in space. Space companies put a lot of attention toward proving their missions' scientific worth. If they put more effort into showcasing the public interest in their missions they would find an influx of revenue. Space missions receive enormous publicity, with millions of people viewing or reading about even the most inconsequential of them. Most major news networks have at least one article about every launch that takes place. With each of those articles is a photo that relates to the mission, whether it be of the launch or the spacecraft itself. Big missions receive even more publicity. For example, in less than two days following the touchdown of Mars Exploration Rover Spirit, NASA's homepage received 513 million hits. (Weiss) That doesn't include the views from all the other sites that ran stories on Spirit. Every major news network has articles on the Mars Exploration Rovers whenever they make a significant discovery. Usually included with those articles or TV coverage is an image of the rover, like the one on the right of Opportunity. This image has been viewed hundreds of millions, if not billions of times. If space companies ran PR campaigns that emphasized how popular space missions are and have the potential to be, they could receive sponsors from corporations around the world that are seeking to increase their own publicity. Don't believe me? Just look at NASCAR. High estimates give NASCAR around 80 million fans in the United States. The 2011 Sprint Cup received an average of 6.5 million viewers. Corporations will spend upwards of 20 million dollars a year to have their logo prominently displayed on one of the cars. The teams often receive multiple sponsors for the same car with one sponsor paying more to have their logo dominate the car. Each car generates roughly $40-50 million from corporations who want their logo somewhere on the car. In addition to the big logos that are obvious in the image to the right, sponsors pay for smaller logos on the car. Sponsors pay all that money to have their logos on the car for only one year. 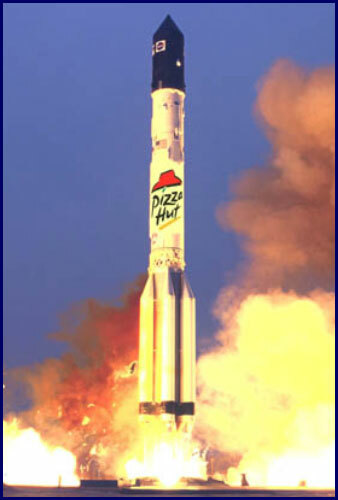 Now what if a highly anticipated space mission was sponsored by a corporation? Let's use Mars Exploration Rover Opportunity as an example again. 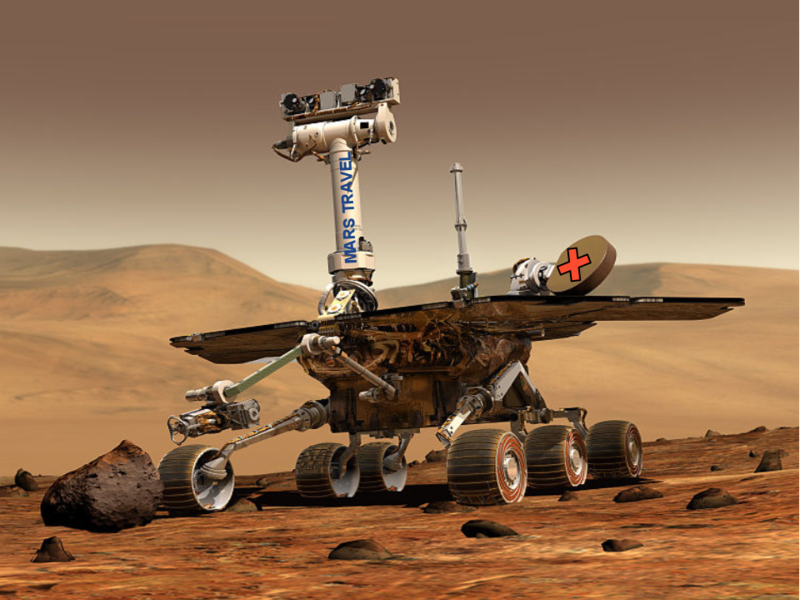 What if it had some corporations sponsor it in return for getting their logo on the rover? Let's pretend Mars Travel and Company X sponsored it. It might look something like the image to the left. Don't you think corporations would be willing to pay a lot of money for the publicity and exposure that would get them? How much do you think they would pay? $100 million? Maybe even $500 million? Or what about $1 billion? Why not? After all, many corporations have shown a willingness to pay around $20 million a year for their logo on a NASCAR vehicle. NASA is a government entity and there are laws against this sort of advertising, but what about private space companies? Why haven't they started getting sponsors? They could receive funding from many different companies, eliminating the monopoly the government has on the decision making process for almost all space missions. So it might look a little tacky to have WAL-MART or DELL on a spacecraft, but why does that even matter? Does it matter who profits from space exploration if everyone benefits? It doesn't make a difference if a discovery is made by the Sony rover or Opportunity, either way a discovery has been made. If a company helps pay for a space mission or project, who cares if they get publicity from it. Humanity would be able to have missions that aren't restricted by what one group wants. How can space companies make this happen? They need to start emphasizing the amount of public interest in their missions. they need to have a PR campaign showing just how fascinated people are with them. Once this is established they need to go to corporations and say, "Hey, we can give you massive publicity if you help us fund this mission." Corporations have shown that they are willing to pay millions to have their logo put in front of an audience, so why not use that to fund really awesome space missions? Today's Image of Mars is of Mars Science Laboratory Curiosity's landing site in Gale Crater. In a previous post I showed the MSL landing site in context of the larger crater, but in this image you can get a better idea of the terrain the rover will be navigating through. MSL Curiosity is set to land here in August 2012. For more on the MSL mission check out my article entitled Mars Science Laboratory Mission. 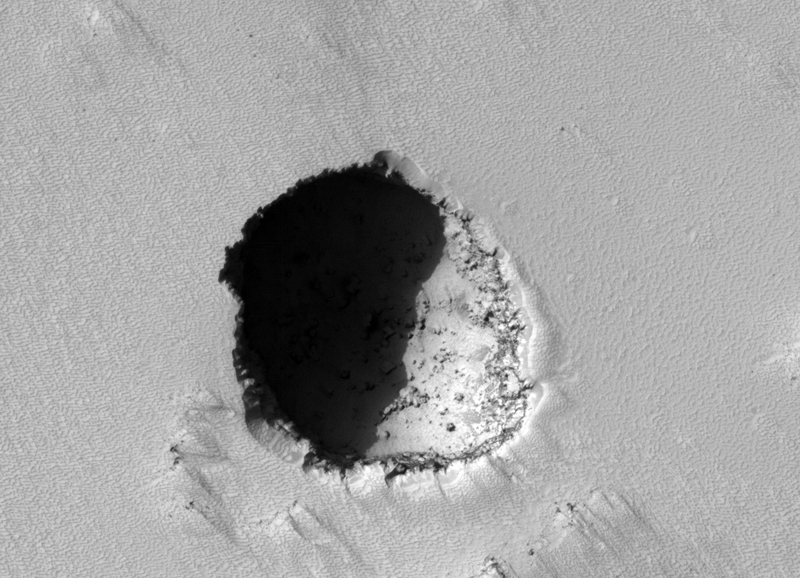 This image is from HiRISE, but they have not currently captioned it. Clicking this image will take you to other photos and articles on Gale Crater. Today's Image of Mars shows extensive layering and faulting in Candor Chasma. Candor Chasma is divided into two parts (East and West) by a large fault. While no one is really sure how the large fault was created, scientists speculate that it could be the result of tectonic processes that pulled the Martian crust apart in similar fashion to a graben. Another theory involves subsurface water erosion that results in surface collapse. While the cause of the fault that divides the East and West Candor Chasma is under debate, it seems safe to say that there was once a lot of tectonic activity in Candor Chasma, as evidenced by the numerous faults and in this image and others. 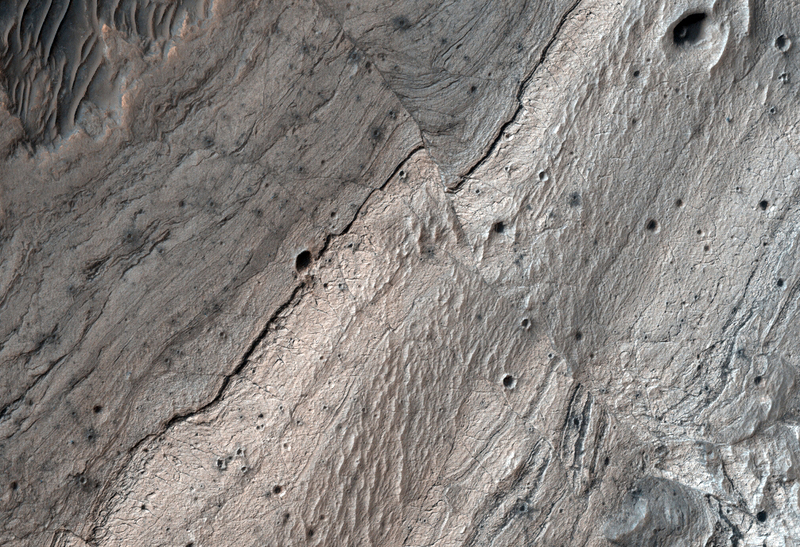 This image is from HiRISE, but it doesn't currently have a caption associated with it, so instead it will link to other images of Candor Chasma showcased by Mars Travel. Today's Image of Mars shows an inverted, winding, riverbed surrounded by features called yardangs. Yardangs are created when the primary form of erosion is wind. They are easy to identify as they have multiple sharp ridges that are oriented in a similar way: a result of wind erosion over millions of years. But why is the riverbed raised? Shouldn't it be carved into the surface? When the river was flowing it deposited layer after layer of sediments, which were harder than the surrounding terrain. Since the river dried up the whole area has spent millions of years being eroded by wind. Because the sediments deposited by the river bed were harder than the surrounding terrain they were eroded much less than the rest of the surface, thus the reason the river bed is inverted. Today's image was taken by HiRISE. Clicking on the image will take you to the original captioned image from them! Today's Image of Mars shows fractured mounds on the southern edge of Elysium Planitia. These are just some of the many mounds found in the south of Elysium Plantilla. On average these mounds measure a few kilometers wide and about 60 meters high. By analyzing the fractures that appear on the mounds scientists have been able to determine that the mounds were pushed up from below. These mounds are peculiar for Elysium Planitia, which is a generally flat area, owing to large lava flows that have covered most crater and land forms (but not all). Scientists speculate that these mounds are actually solidified lava because they join and share a common texture with the flood lavas that cover all of Elysium Planitia. This image was taken by HiRISE in 2008. if it looks strange, that's because it is actually a 3-D image. To see it in 3-D relief you will need to use red-blue glasses. Don't have 3-D glasses? Fortunately Amazon has them for only $0.16 (Plus S&H)! Viewing images of Mars in 3-D allows you to see just how magnificent Mars really is! It is definitely worth the small investment! Clicking on the image below will take you to a brief article on the image from NASA. Today's Image of Mars shows defrosting dunes and gullies during late summer in Mars' southern hemisphere. Mars Reconnaissance Orbiter's HiRISE monitors defrosting sites in hopes of learning about the defrosting process on Mars. It might sound mundane, but this knowledge may one day help explorers survive by helping them to follow one of the many gullies on Mars to its source. One of the primary needs of explorers will be water and being able to find it if no satellite coverage is available could mean the difference between life and death. Today's Image of Mars is actually a map of the Tharsis Quadrangle, which covers the area from 90° to 135° west longitude and 0° to 30° north latitude on Mars. Tharsis Quadrangle is home to numerous large volcanoes, including the largest in our solar system, Olympus Mons. 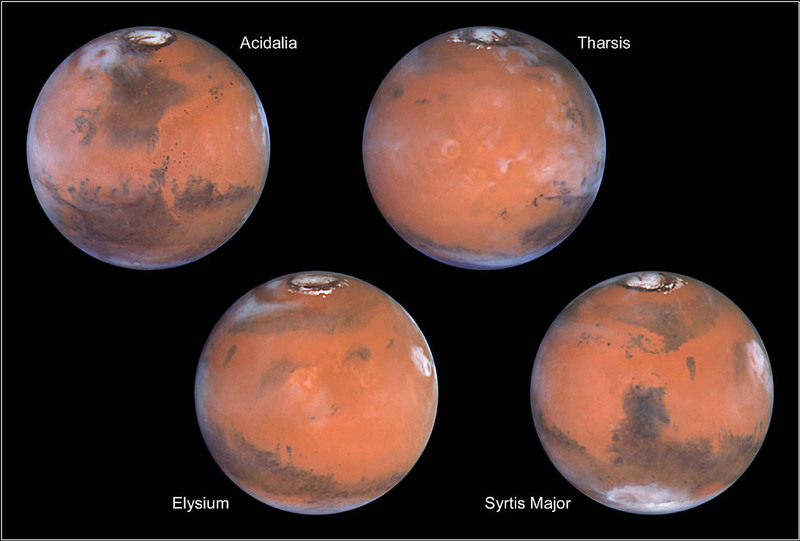 It is thought that at one time the volcanoes in Tharsis Quadrangle had a large impact on the Martian climate. 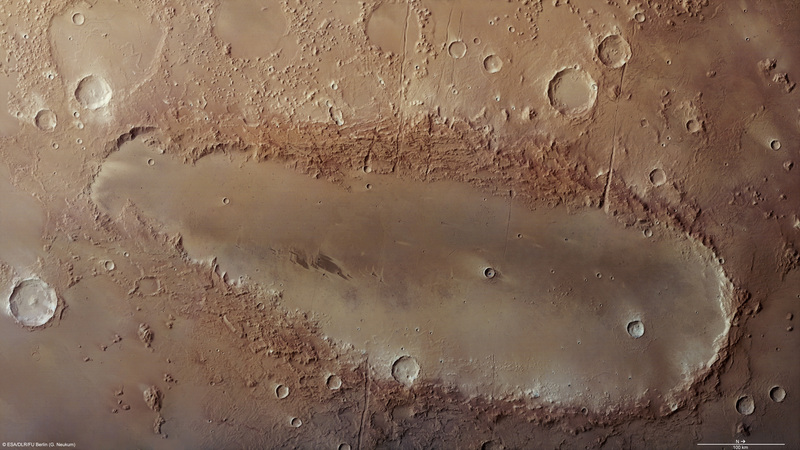 A large amount of carbon dioxide and water vapor was released into the air from the volcanoes in the Tharsis Quadrangle. 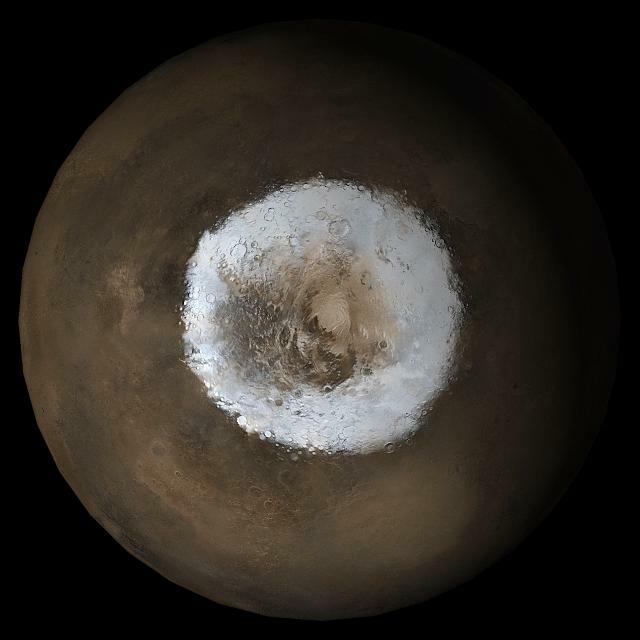 Estimates show the amount of gas emitted by the volcanoes in the Tharsis Quadrangle would have been enough to produce an atmosphere thicker than Earth's. Additionally, the water vapor released from these volcanoes would have been enough to cover all of Mars in 120 meters of water. 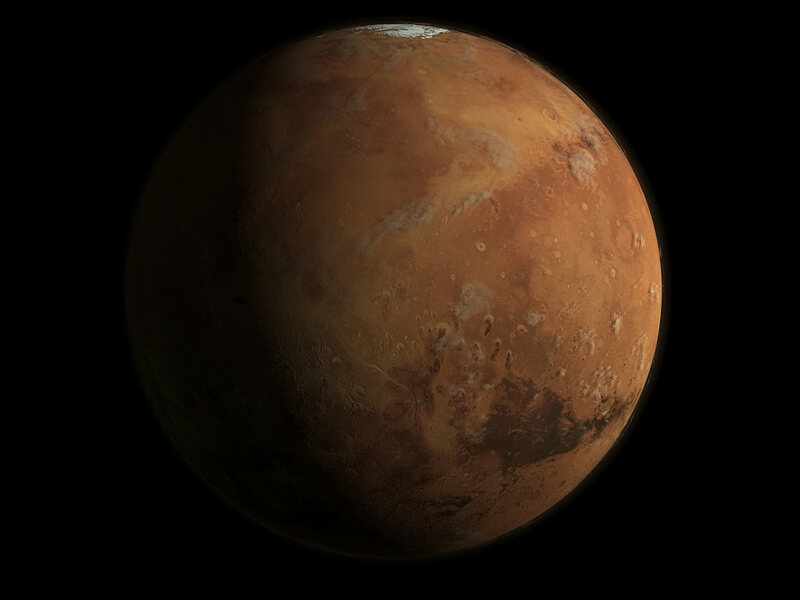 The volcanoes in Tharsis Quadrangle lead many experts to believe that Mars once had an atmosphere thicker than Earth's and that it was once a warm and wet planet. This Tharsis Quadrangle map is one of 30 quadrangle maps used by United States Geological Survey (USGS) Astrogeology Research Program to catalogue Mars. Clicking on this image will take you to a list of maps produced by the USGS for Mars. From there you can open many of the maps of Mars produced by the USGS. 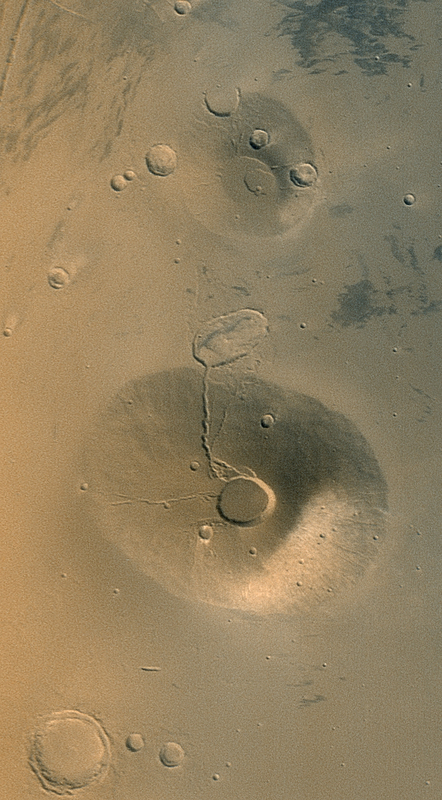 Today's Image of Mars shows Ceraunius Tholus (lower) and Uranius Tholus (upper), two Tharsis volcanoes on Mars. The fact that these volcanoes have craters on them tells us that the volcanoes are very old and inactive today. If they were active then lava flows would have covered any impact craters. if you look at the bottom right of the larger Ceranius Tholus you will see that it is much lighter than the surrounding terrain. What you see are the deposits left from the global dust storm in 2001. To give you some idea of scale, the large crater you see in the center of Ceraunius Tholus is approximately 25km in diameter. Ceraunius Tholus rises about as high above the Martian surface as Mt. Everest. This image was taken by the Mars Global Surveyor (MGS) Mars Orbiter Camera (MOC) in 2001. Clicking on it will take you to the original image fact page from NASA. The European Space Agency (ESA) has stopped attempting to communicate with Phobos-Grunt via their ground stations. This comes after consultation with the Phobos-Grunt mission controllers. The ESA emphasizes that it remains available to assist Roscosmos with Phobos-Grunt if the situation changes. Since a brief link-up with Phobos-Grunt a week and a half ago there has been no communication with Phobos-Grunt despite numerous attempts by Roscosmos and the ESA. NASA has also been offering technical and communications assistance to no avail. For the latest information I highly recommend that you follow @MarsTravel on Twitter because I will post information there first and more frequently. An easy follow button has been place below for your convenience. 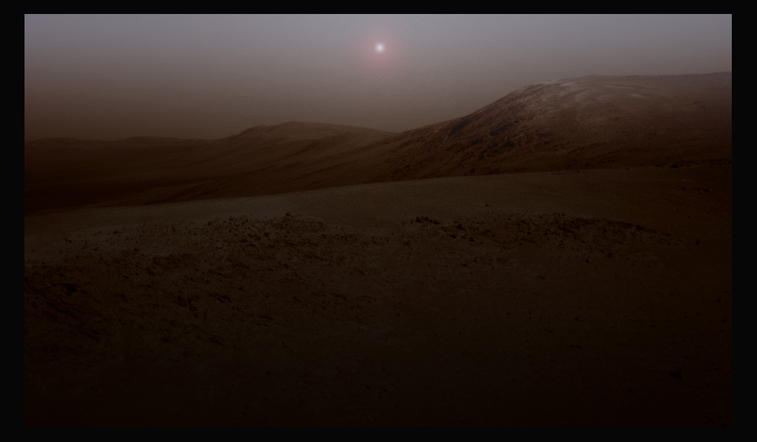 Today's Image of Mars is of a simulated sunrise on Mars taken from the vantage point Cape York. This image was created by Stuart Atkinson using an image taken by Mars Exploration Rover Opportunity. He then inserted the Sun and and sky effects. Atkinson has dubbed this "Endeavour Sunrise." While he claims it is not accurate, I will venture to say it is about as accurate an interpretation as you're going to get. The only thing more accurate would be if Opportunity was sending back full-color images. Clicking on this image will take you to Stuart Atkinson's post on The Road to Endeavour which contains this image.